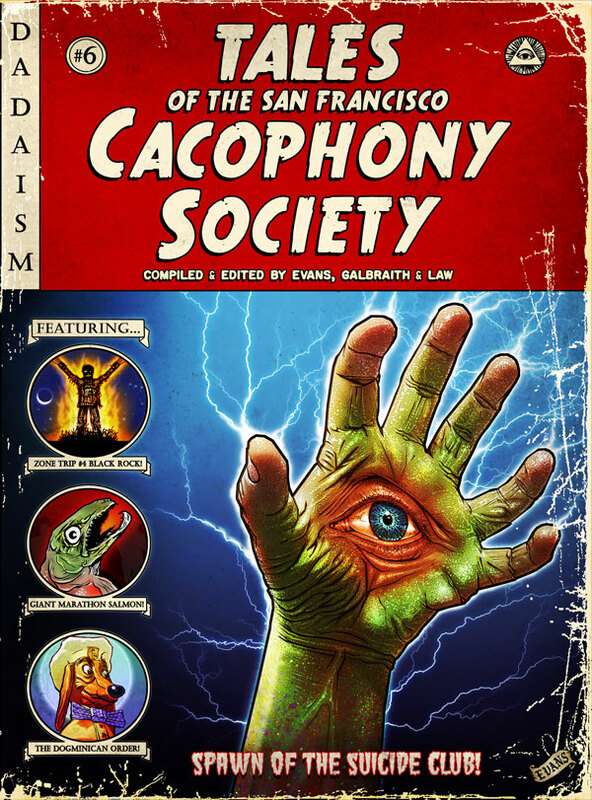 John Law and Last Gasp announce Cacophony Society history book! Lock up your conservative co-workers’ tiny brains, lest they explode all over your shiny new copy: It’s finally happening. 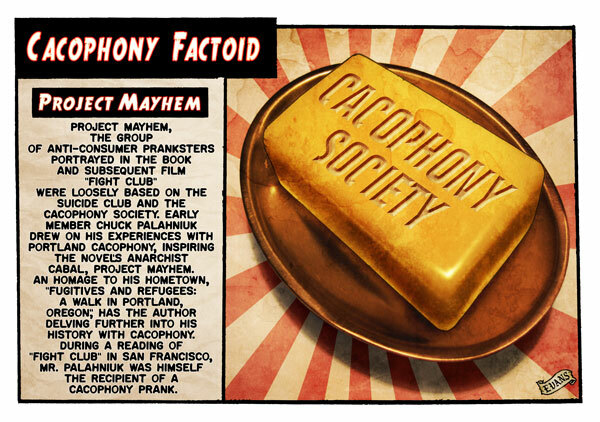 A book concerning The Cacophony Society’s proto-history is coming out. Full disclosure: This writer and John Law are members of the same mutant bike club, the Heavy Pedal Cyclecide Bike Rodeo. It’s the world’s only pedal-powered carnival ride midway and bicycle-themed circus sideshow with a punk rock mariachi band and unhinged rodeo klowns … the traveling Johnny Bike-Seeds of a larger mutant bicycle family. Separately, as a nightlife reporter for the San Francisco Bay Guardian at the turn of the century, this writer covered the late-’90s Cacophony scene before the dot-crash sent all our jobs flying and forced us underground. During that time, it seemed John Law had a hand in facilitaing at least half the “odd and unlikely” events which ended up in my A&E column. As even a brief study of Law’s life proves, the co-founder of Burning Man is not “all about” Burning Man, but went his own way long ago. Indeed, he sued his partners after a philosophical split reached a tangible head. Law prides himself on being one of the Cacophony festival offshoot’s creators-turned-opposers who continues to do his own thing, planting cultural grenades everywhere and watching them explode. Among other things, John Law wrangles neon for a living. He built a huge sign for the Cyclecide “swearhouse” out of millions of other neon signs he collected that reads “FUN” in letters 15 feet high. 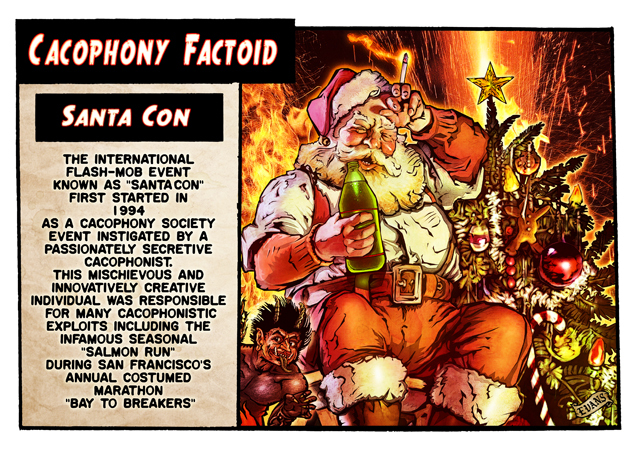 He ‘hanged himself’ as Santa from a San Francisco lightpole during SantaCon / Santarchy’s heyday (before it became a worldwide pub crawl), and hunted a remote-controlled car through the desert for sport. As part of Survival Research Laboratories, he fabricated kinetic exploding sculptures for a crew who makes huge robots that fight each other. He once careened down a guy-wire into a flaming wall of live neon, and he has climbed the Golden Gate Bridge over 100 times (do NOT try this at home[-land security], folks). Law is an urban adventurer of the highest order — a radical-experience organizer and a thought-revolutionary-in-the-night. He and his more shadowy Cacophony co-conspirators are the closest thing you’ll ever meet to Tyler Durden, and they most likely served as the character’s inspiration. 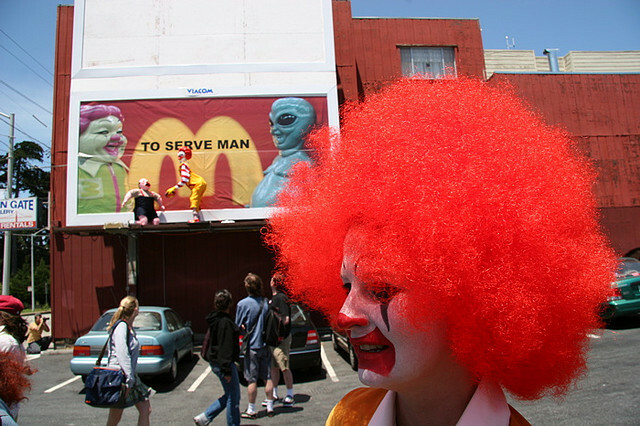 This writer is also honored to have been trained by John Law in the nebulous art of Cop Whispering, and even was selected to serve as Cop Whisperer at Law’s legendary facilitation of Ron English and the Billboard Liberation Front’s prank, “To Serve Man,” for Ronald McDonald’s 50th birthday. (See footage of that event here, here, and here. Bonus: a two-minute video about the BLF from Negativland). The Billboard Liberation Front is but one long and slithering tentacle of Cacophony, which spreads darkly now over the subculture, morphing and twisting and heaping teaspoons of e.coli into the planet’s primordial soup (as the saying goes). The Billboard Liberation Front practices culture jamming by altering billboards by changing key words to radically alter the message, often to an anti-corporate message. It started in San Francisco in 1977. I’m not saying the Cacophony Society — who were themselves influenced by Dadaists, junkyards, Proust, the Merry Pranksters, punk and new wave, surrealism, cyberpunk, and Situationist International — invented everything from culture jamming to Banksy, but … they kind of did. Hive mind activity is a powerful thing. The Ramones and the Damned sprang up independently on opposite continents at the same time, for example. Nevertheless, ain’t no harm in paying respect to the most fun pioneers ever. #Occupy erupted in the butterfly effect of Cacophony, when the rest of the world longed to drop all the seriousness and create Temporary Autonomous Zones, too, but in the middle of existing cities this time, in broad daylight, as civics. The methods John Law and his cohorts in the original Cacophony Society developed while exploring forgotten urban terrain in the dark of night have been well-honed over the decades, and now serve the #Occupy movement in other, more tactical ways. From peacefully hilarious St. Stupid’s Day parades to the old “sit-in-a-circle-with-one-person-in-a-gorilla-suit, and-only-pick-one-Cop-Whisperer-to-talk-to-the-cops” rule … to the massive amount of coordination it takes to wrangle and safekeep and self-sufficiency-train tens of thousands of partygoers in one of the harshest environments on Earth … these tried-and-tested methods of “leaderless leadership” have, along with the Internet, translated Cacophonous teachings into worldwide Flash mobbing, anti-serious, non-dour ‘protest’ theatrics, and potentially serious, revolutionary Mayhem. For tales of more Cacophony Society doings, you could also buy Re/Search’s PRANKS! 2 book, read Brian Doherty’s book This Is Burning Man, watch Oliver Bonin’s film Dust and Illusions, and go see John Alloway’s long-awaited official Cacophony Society documentary film, Into the Zone. See if you can find a copy of John Law’s book of short stories about bridges (he’s obsessed with them) called The Space Between. And if you can’t find your own living superhero of a friend who will herd the whole crew on a local outing to dangle from guy-wires under scary railroad bridges, or on a cross-country Head Trip towing the Holy Trinity of the Dogminican Order behind a bus covered in mutant Cyclecide bikes … well then, looks like you’ve got some work to do, to go be a Tyl— er, a John Law yourself. Get crackin’. That’s the whole point, after all. 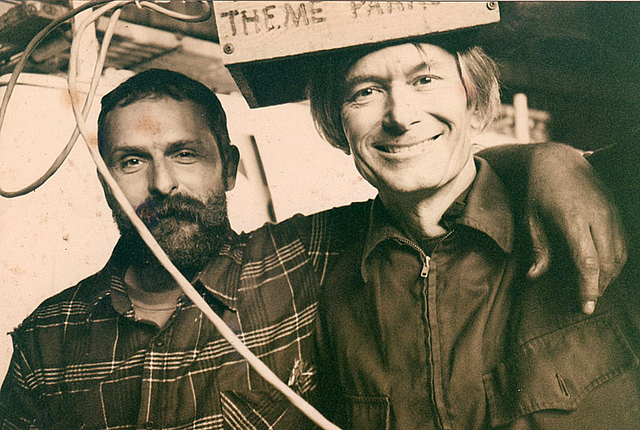 John Law and Burning Man’s Michael Michael a.k.a. Danger Ranger — the Cacophony Society’s *other* main original instigator — working on the 1994 SRL show at Pier 70 in San Francisco. M2 wearing his home-made control box labeled “MOLOCH THEME PARKS”, which operated the neon Cone of Doom. To Serve Man photo by Scott Beale of Laughing Squid. John Law and Michael Michael photo courtesy of M2’s collection. Footage of the 1994 SRL show at Pier 70 here. And for “Bob”‘s sake, have some slack. it’s always amazing to see how far the community has gone – from an anarchist heaven, to throwing one of their own with glee into real life prison, to a sort of evolutionary stasis where everything happens on time or else, and everyone knows exactly what to expect. Although I was never at Burning Man during the free-wheeling days before 1996 and Chicken John’s repudiation of the event, I can understand how as one of the founders of the SF Cacaphony Society why he would feel that way. However, what works for 2,000 people doesn’t work for 50,000+ — someone has to order the portapotties, after all. But to claim what happens on the playa is in stasis and there are no surprises at all like some dusty version of Disneyland is absurd. if everyone had to bring their own portapotties, there wouldn’t be 50,000 people out there. all the surprises on the playa are allowed to happen in accordance with the laws of the state. Then it sounds something like the 4th of Juplaya would be more to your liking. Ok class, get out your shiny new text book #6, if you’re driving at 155 mph on the black rock desert in the state of NV and it’s 1996, what Law do you abide by? would like to choose, but my posts are being censored.